My kids each have a reading lamp by their beds. They also have a torch (in case they need to get up in the night). Is it possible to combine both? Yes! And you won’t believe how beautiful and clever the solution is. Have a soft glow or lots of of light with Lumio, a multi-purpose portable lamp that unfolds like a book but does a whole lot more. 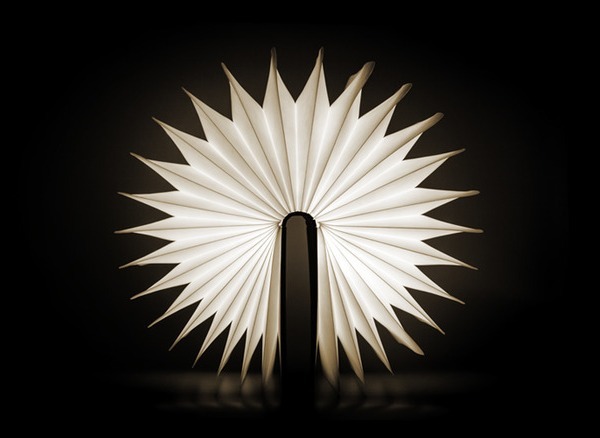 Lumio is compact, lightweight and cordless – open the book and Lumio turns on (and lasts eight hours if fully charged). Control the brightness of the lamp by how far Lumio is open – perfect for transforming it from a reading lamp to a gentle night light. There are no buttons, cords or exposed light globes so Lumio is perfect for the nursery. It’s powered by high output LED lights and a long lasting lithium battery. The battery can be recharged via a power connector located discreetly on the wooden spine of the book. Lumio transforms into all sorts of shapes and includes super strong magnets built into its cover, allowing you to mount the lamp on metal surfaces in various configurations – after watching the stunning video below, I’ve decided I needed at least three Lumios! Lumio is a Kickstarter project and therefore relies on people to invest in the project in order to make it happen. Clearly people recognise an amazing project when they see it – Lumio has far exceeded the original investment goal of US$60,000 – with ten days to go, Lumio had received pledges of over US$408,000! I think it’s safe to say this project is going ahead and we’ll see Lumio available to buy later in the year.